The videos below document the cases of four of the Occupy Oakland plaintiffs in two separate incidents. They reveal police violence through interviews and the on-scene video of plaintiffs, witnesses, and never-before-seen Oakland police body-mounted cameras (PDRDs). While there were many incidents investigated in the Occupy Oakland Campbell lawsuit, the following two incidents of police violence have similarities that underscore serious problems within the Oakland Police Department. 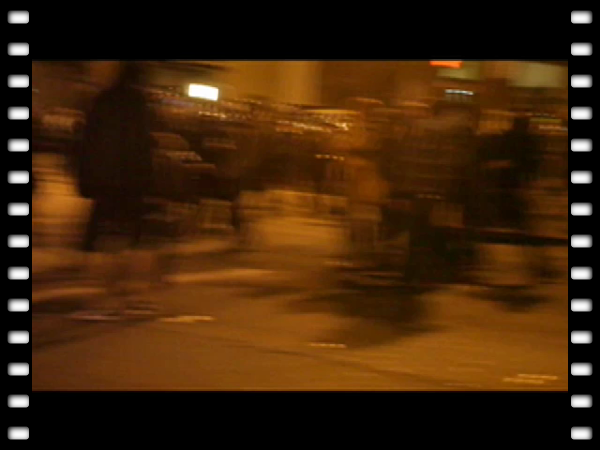 The first video is of Scott Campbell being shot by a lead-shot-filled beanbag round following Oakland’s General Strike on the night of November 2, 2011. In the case of Scott Campbell, the command to shoot anyone crossing an invisible line is illegitimate. How could people know they were in harm's way? Less than lethal weapons are supposedly intended for situations where violence is taking place and the officer needs to defend themselves and other officers. This is simply not the case with Scott Campbell. As you can see in the video Scott is not approaching the line, but rather walking parallel to it. 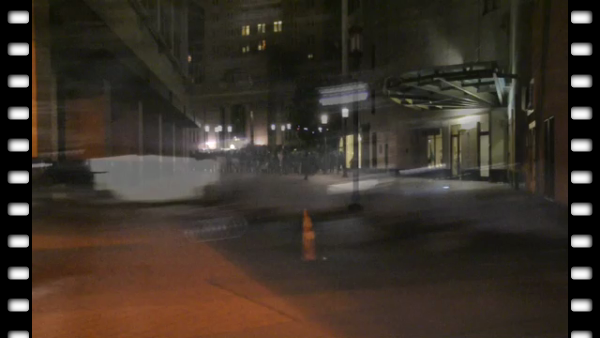 As you can see Oakland police officer Victor Garcia waits until Campbell is almost out of view to fire at him. Not because Campbell suddenly takes a turn towards the police line, or poses a threat, but Garcia fires at him because he can see that Campbell was just an inch over the invisible line marked by a roll of toilet paper. Garcia didn’t shoot to defend or protect, he shot because he knew he could get away with it by deliberately misinterpreting his commander's order to fire at anyone who crossed the invisible line. The second video below is of the violent arrests of Brooke Anderson, Max Alper, and Kevin Christensen following the raid of Occupy Oakland on the morning of October 25, 2011. 2. Both officers were under the command of officers who have been involved in shootings. Oakland police Captain Ersie Joyner has been in involved in five shootings, one with Cesar Garcia in fact, and Oakland police lieutenant Fred Mestas has been involved in at least two shootings. 3. Both Garcias showed premeditation in their acts of violence. Victor Garcia knowing the order was to shoot anyone who crossed the invisible line, trained his gun on Scott Campbell as he walked parallel to the line and waited until he saw that Campbell was just an inch past the line before shooting. Cesar Garcia was the only cop who had his baton out ready to swing when Lt. Mestas ordered the arrests.